DENVER (AP) A sturdy plane and a good night’s sleep did wonders for the Phoenix Suns. 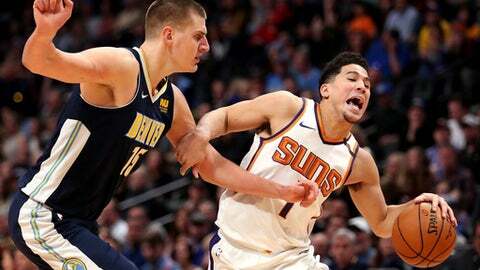 Devin Booker scored 30 points, T.J. Warren had 25 and the Suns defeated the Denver Nuggets 108-100 on Friday night. Murray was one of the few bright spots for Denver. The Nuggets have lost six of eight, including two at home to teams who combined were 34 games below .500. ”How many times do we need to come in at halftime to talk about effort?” Denver coach Michael Malone said. ”As a coach, it’s the hardest thing to do that. Suns: Warren missed the previous two games with lower back soreness. … F Marquese Chriss missed his fourth straight game with a hip injury. Triano said Chriss might undergo further testing. ”I know that he is concerned,” Triano said. ”I’m sure he will do what he wants to do.” … The Suns won on the road for the first time in 2018. Nuggets: G Monte Morris was brought up from the G League but did not dress once Murray cleared the concussion protocol and was able to play. … Several Colorado Rockies players were on hand during the team’s winter caravan. Charlie Blackmon, Chris Rusin, Tony Wolters and manager Bud Black sat courtside. Denver Broncos linebacker Von Miller also was courtside. Chandler and Nuggets center Mason Plumlee exchanged hard fouls at the end of the second quarter, evoking memories of the 1990s NBA. Chandler’s foul was slightly harder and resulted in a flagrant-1 call, but both players kept their cool. The Kentucky Wildcats were well-represented in the game. Four of the 10 starters played at least one year for coach John Calipari, including the two leading scorers in the game. Suns: At the Milwaukee Bucks on Monday night.